Paul, a mercenary in Africa, decides that he can no longer work for the Organization because of their brutal tactics. But the evil Organization refused to release him, and Paul finds that he must fight his way out. A slave hunter attacks a ship on sea in which six girls are on their way to Australia. They succeed in escaping and are being picked up by a whaler. the only thing this misbegotten little fart of a movie has in common with the works of the old man of providence is the word 'cthulhu'. which, incidentally, appears all of once in the movie, on a gate over the driveway to the titular mansion. aside from that, it's just one more chance to get a bunch of oversexed 'teenage' characters in a big house/summer camp/abandoned insane asylum and kill them off in various nifty ways. 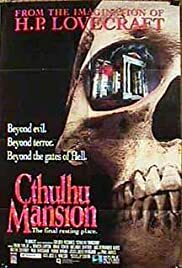 no plot, special effects the nerdy kid down the street could duplicate given $50 dollars and a ride to home depot, and the disappointing tease of seeing something lovecraftian on your tv. the human bloodstream cannot hold enough thc to make this dog interesting.